When you’re serious about drumming, you need a kit to match your ambition. The V-Drums TD-17 series lets your technique shine through, backed up with training tools to push you further. 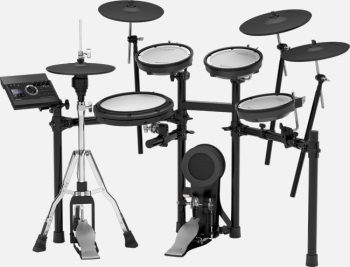 Combining a TD-50-class sound engine with newly developed pads results in an affordable electronic drum kit that’s authentically close to playing acoustic drums -- accurately mirroring the physical movement, stick coordination and hand/foot control that every drummer needs. Meanwhile, an array of built-in coaching functions will track your technique, measure your progress and increase your motivation. Becoming a better drummer is still hard work, but the TD-17 can help you get there.